"Luftfilter mit Gehäuse, 14″x3″, Chrom, Pro-Flo"
Filter Height (in): 3.000 in. Net Height from Carb Flange (in): 3.750 in. Dropped Distance (in): 0.625 in. Notes: Designed to fit all Edelbrock squarebore and Q-jet carburetors. Solve your hood clearance issue with this slim design air cleaner. 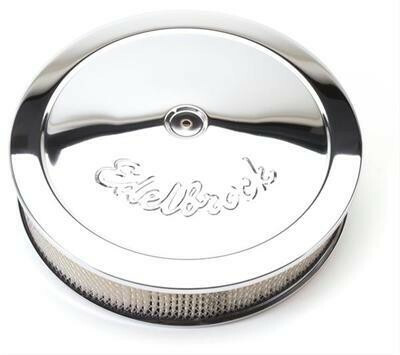 These Edelbrock Pro-Flo air cleaners are the perfect solution to your low hood clearance problems. Theses high quality air cleaners are available in several styles and sizes to suit your tastes and fit your ride.